Booking Pierre Koffmann will cook up a storm at your special event! We are a booking agent for Pierre Koffmann, and can arrange for him to speak for your guests. Combining a rustic gutsiness with haute cuisine, Pierre Koffmann knows how to combine tastes and flavours like no one else. Pierre cooks the kind of food he likes to eat. This is the food of the French countryside and of his grandparent’s farmhouse kitchen in rural Gascony. After training in his hometown of Tarbes, southwest France, Pierre Koffmann worked his way up at restaurants across France and Switzerland, before moving to the UK. Pierre quickly found himself working as Sous Chef for Michel and Albert Roux at Le Gavroche and within six months he was promoted to Number 2. After a quick stint at Brasserie Benoit in the City, Pierre was appointed Head Chef at the Roux Brothers’ new Waterside Inn at Bray. 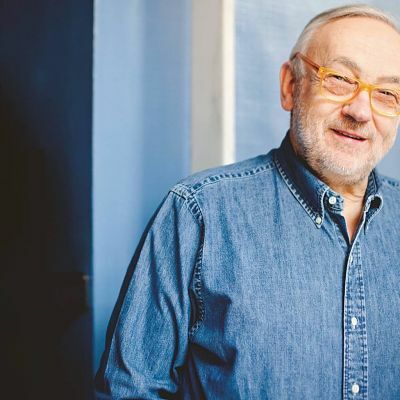 In his five-year tenure Pierre Koffmann helped them achieve two Michelin stars. In 1977, with backing from Michel and Albert Roux, Michael Caine and Professor Von Clan, Pierre Koffmann opened his first restaurant, La Tante Claire, in Chelsea, achieving his first Michelin star the following year, a second in 1980 and third in 1993. La Tante Claire moved to The Berkeley in 1998 and continued as one of London’s top restaurants for another five years before Pierre Koffmann decided to move on to other projects. Sensing the call of the restaurant trade once more, in 2009, Pierre agreed to take a ‘pop-up’ La Tante Claire to be the Restaurant on the Roof at Selfridges for one week. It was such a success it continued for 2 months before Pierre Koffmann once again returned to The Berkeley Hotel in Knightsbridge and to open Koffmann’s with partner and business partner Claire Harrison. Koffmann’s offers a relaxed, informal style with classic provincial French cuisine, reminiscent of Pierre’s childhood in rural Gascony and the food that first inspired Pierre to follow his love of cooking using fresh, seasonal ingredients to deliver exquisite unspoiled flavours. 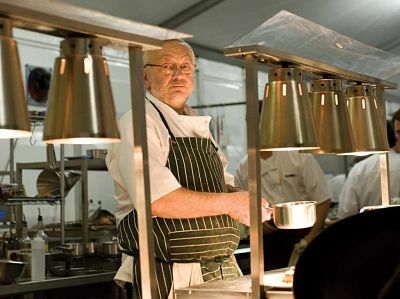 Pierre has since worked as a consultant to many companies, including his current ventures with Waitrose, Sodexho and Company of Cooks for the Royal Opera House. 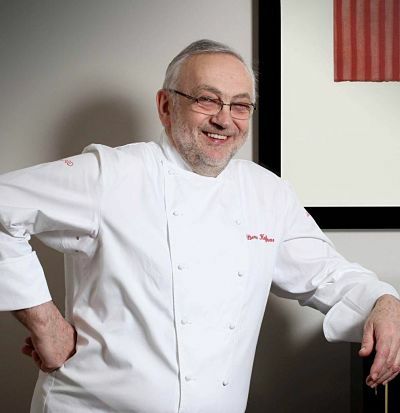 Pierre Koffmann‘s career and enormous influence has been recognised with many awards, in addition to Michelin stars, Pierre was awarded five rosettes by the AA Restaurant Guide, 10/10 by the Good Food Guide, and the Ordre du Mérite (Chevalier) – the French equivalent of a Knighthood. In May 2014 Pierre was presented with the Laurent Perrier Lifetime Achievement Award at the twelfth annual Tatler Restaurant Awards. Pierre’s cookery books include Memories of Gascony (April 1990; Pyramid Books Ltd), and La Tante Claire: Recipes from a Master Chef (Sep 2012; Mitchell Beazley). Pierre Koffmann has appeared on numerous television shows, most recently Masterchef and Masterchef: The Professionals (BBC), Saturday Kitchen (BBC), and The Chef’s Protégé (BBC). Contraband is the UK’s top booking agent, with friendly, skilled account managers who guarantee you the best deal possible. Contact us today if you would like to book Pierre Koffmann to be the headline of your event! We as your booking agent are more than happy to help you create the most memorable moments with Pierre Koffmann.